Here we have an important new discovery, giving rise to the identification of a new centre plate ‘B2’ (Fig.3). 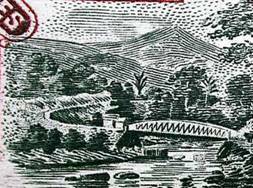 The new state is identifiable only in positions 31 and 33 and is confirmed by ‘light’ doubling of the lower hillside. It is more easily detected and slightly more positive in #33. Much less prominent is doubling of the left hand precipice side. ‘The first printing of ‘III + B1’ was used in the Congo and the remaining stock surcharged E.A.A.O.B. The second combination ‘B2’ was created by the re-entry of the centres of stamps 31 and 33. This printing was initially used in the Congo , subsequently surcharged ‘5c.’ for the Malines ( London ) of 1922 and also overprinted E.A.A.O.B’. OAT and AV2 markings have fascinated collectors for decades. The research of them is an evolving study. The ‘OAT’ initials were used as an acronym for ‘Onward Air Transmission’. Nineteen basic types were used between 1940 and 1965. 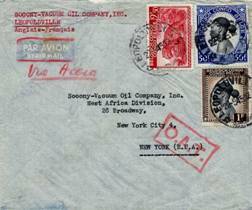 ‘AV2’ was an abbreviation for ‘Avion 2’, which was one of various ‘UPU forms’ that accompanied international mail in transit. It is now known that twenty-four basic types of this were in use during the period 1940 to 1956. In comparison with the number of OAT marks, these are much scarcer as less than a tenth of that number were used on covers from the Belgian Congo. The ‘AV2’ was applied to ‘small quantities of mail’, which were collected into bundles or packets, and sent from one country to another in a sealed bag or pouch. 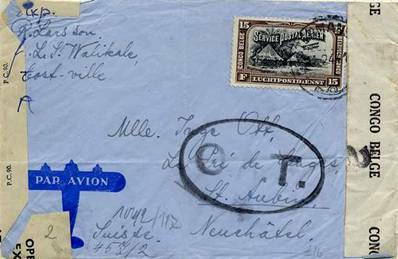 “Where there was insufficient airmail to one or more countries to justify the use of individual bags to each, such mail would be tied into bundles or packets and labelled for each destination. A number of packets to different destinations would be put into a single mailbag, which was then labelled and despatched to a post office in a country where the ongoing routes to the individual destination countries converged. These offices were known as ‘Exchange Offices’. On arrival at the ‘Exchange Office’, the bag would be opened and the individual packets re-bagged, either to be reopened and re-dispatched again further down the line, or dispatched as airmail from other locations to its final destination country in a sealed closed bag. The most common usage of OAT marks, ‘Type VI’ (Fig. 3) and ‘Type VII’ (Fig.4.) was from Belgium and the Belgian Congo to the U.S.A. Figure 5 illustrates the use of OAT ‘Type IX’ and Figure 6 the use of ‘Type XI’. Others, such as OAT ‘Type I’ and OAT ‘Type IV’ (Fig.1) are much more uncommon. 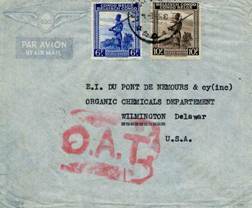 As stated above the use of the AV2 markings on Belgian Congo covers is much less common than the use of the OAT ‘s. Figure 2 illustrates the AV2, ‘Type 6’. I wish to acknowledge and thank Murray Heifetz and Emile Hoorens for their help in making this article possible and Stuart Smith for providing coloured illustrations from his collection. Greg Schmidt, American Airmail Society, 1978 Fox Burrow Ct. , Neenah , WI 54956-1184 . 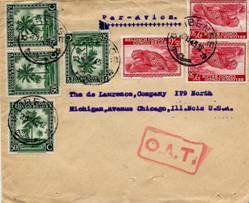 U.S.A.
* The PAR AVION label is cancelled in green ink. * Circular ‘CASABLANCA-POSTES 6-12 42’ transit mark, white censorship tape with “CONTROL POSTAL ” and oval cachet ‘OUVERT / PAR LES / AUTORITÉS DE CONTRÔLE’. 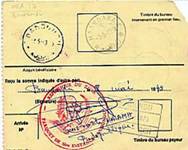 * French post office ‘TANGER CHERIFIEN 19-12 42’ transit and the following day an oval ‘REGISTERED / 20 DE 42 / BRITISH. P.O. TANGIER. * It arrived in France ; probably having passed through Spain . The German single circle ‘Oberkommando der Wehrmacht X’ was applied in Paris . It is the only letter I have seen that crossed so many African borders before arriving at its destination in Europe . 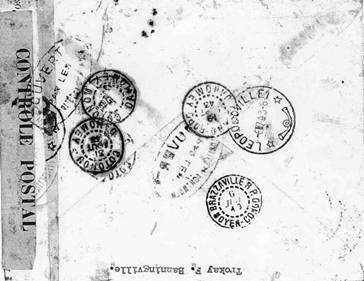 Five different Censors opened the letter. The journey took 4 months and 10 days. Having been opened in both Gold Coast and Gibraltar it is apparent the British Censors didn’t trust each other! It is understandable they didn’t trust the French, who were not all on De Gaulle’s side. Who, where and why was the one line cachet ‘Acheminement impossible’ applied? After the outset of W.W.II, Belgium became occupied by German troops in May 1940. The Belgian Congo entered the war in August of that year following declaration of Italy ’s alliance with Germany . In October 1940 a ‘2 circles’ cancellation POSTE MILITAIRE / CONGO BELGE N°4 was used for troops based in Watsa, North East Belgian Congo. In February 1941, a first contingent was sent to Sudan and Abyssinia . As from July 1941 they used the ‘2 circles’ stamp with N°3, (Fig. 2) until the end of December that year at which time the troops returned to the Congo . I have in my collection several Belgian Congo stamps cancelled by the ‘Poste Militaire Congo Belge N°3 and N°4’ in Ethiopia (These do not reproduce satisfactorily in the Bulletin – Ed) and a nice ‘N°4’ used in Nigeria on British stamps (Fig.4). 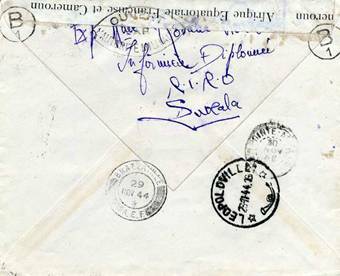 “A cover with Postes Militaires Congo Belge N°4 dated 1st September1941. It was sent from Watsa and has three different censorship tapes. There is a green and white Sudanese censorship tape on the left side of the cover, a British censorship tape on the bottom of the cover and a scarce ‘Censure Militaire Congo Belge censor tape on the right side of the cover. “As a result of my request for information about foreign censor marks on Belgian Congo related correspondence – this contribution is the third in an evolving series. Many new examples have been reported and several scanned or photocopied illustrations received. The response has been both helpful and much appreciated but unfortunately not all examples lend themselves to clear reproduction. For that reason it is not possible to illustrate examples of all now on record, but I hope that your appetite will be whet and any member with clear examples will let me have them so that they may be added to our ‘data base’ and included in later articles in this series. i. A sharp edged oval ‘OUVERT / PAR / L’AUTORITÉ MILITAIRE’. (Fig.1). vi. 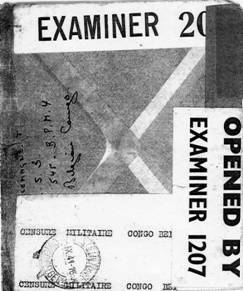 Other non-reproducible censor labels and cancellations of Brazzaville and Cotonou , Dahomey . i. ‘CENSURE CONGO BELGE’ stamp of Leopoldville . Ref. (ix) - This advertisement for a victory loan exists in two forms, one inscribed ‘Souscrivez a L’Emprunt de Victoire Schrijf in op de Overwinningsleening’ and the other with the Dutch word ‘Teeken’ replacing ‘Schrijf’. Figure 4. Figure 5. Figure 7. Figure 6. Figure 8. Figure 9. A large 2-circle ‘CONTRÔLE POSTAL Commission C’ censor mark is known to exist but no example is available for illustration. 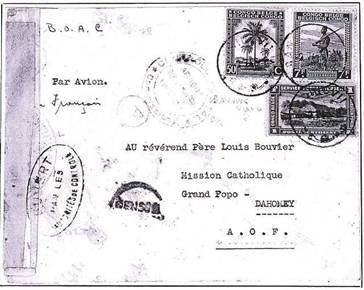 A large 2-circle ‘CONTRÔLE POSTAL (AFRIQUE EQUATORIALE FRANÇAISE) Commission G’ (Fig.12) and cancel of Port Lamy is recorded 14 July 1941. In total, five covers have been examined and in addition to marks already referred to, the one common to all is ‘CONTRÔLE TÉLÉGRAFIQUE Commission A’. No example is available for illustration. 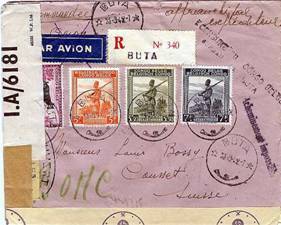 This is recorded as a transit mark applied at Cotonou February 1941 and was illustrated on cover (Bulletin 133, p10). 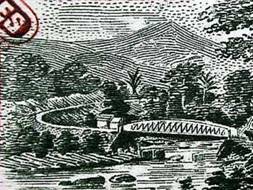 A further, somewhat blurred illustration is shown in Fig.12. i. Large 2-circle ‘CONTRÔLE POSTAL (TERRITOIRE DU CAMEROUN) Commission A’ (similar to Fig.14). Recorded in use May1942 to April 1943.
ii. Label – ‘CONTROLE POSTAL MILITAIRE’. (Fig.15) Recorded in use May 1942 to April 1943.
i. Large 2-circle ‘CONTRÔLE POSTAL (TERRITOIRE DU CAMEROUN ) Commission B’ (Fig. 14) recorded in use, January to April 1942. 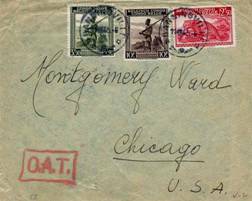 Note – Whilst in many cases illustrations of postmarks, cancellers etc. are approximately similar in size to the originals, they should never be considered as accurate or used for reference or comparative purposes. In concluding this series of articles it is intended to confirm as far as possible the precise dimensions referred to. 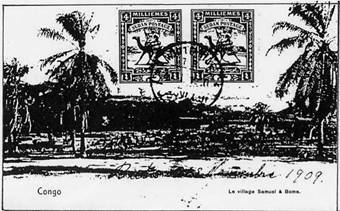 While studying some old ‘Postal Mandats’ I came across a cancellation (Fig.1) which is not listed in Cellis’ book ‘La Philatélie de Transition’. The cancellation would seem to be an updated form of H&K’s type 17, a type specifically intended for use by the ‘Bureau de Cheques Postaux’. Question – Has anyone come across this? Please get in touch if you have. 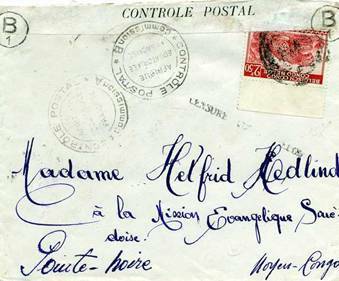 The ‘Mandat de Poste’ (Fig.2, sides ‘a’ and ‘b’) functions as the equivalent of a British Postal Order except that the format is different. The major difference from the U.K. system is that having paid the money to the Post Office, you don’t take it away with you and arrange your own delivery to the recipient – the Post Office retains it and delivers directly to the address declared on the Mandat. From memory, the original format was in three sections, each divided by perforations. The first of these is for the sender on payment of the required sum (Z19.84 in this case) and is his receipt. The one illustrated was cancelled at Mbandaka 1 (previously Coquilhatville) with the I.7 – CEL/C cancel, dated 03.05.73. 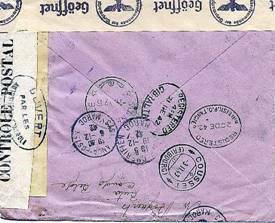 On arrival at its destination, the receiving office applies its cancel in several places (in this case the Bandundu I.2/-, dated 07.05.73 was used) and the 2nd section of the Mandat is detached and put in the recipient’s post box as notification. 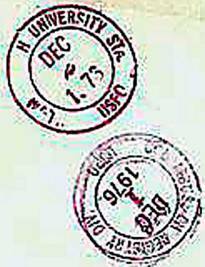 If the Mandat has to pass through several different post offices ‘en route’, then each will apply its cancel to the Mandat. When the recipient calls at the destination post office he is paid the appropriate sum and he signs the 3rd section. In the illustration, being an official government office, the recipient has also applied the official stamp. The post office cancels this third section again (here dated 09.05.73) and keeps it as its proof of payment. It is just this 3rd section, retained by the post office that is illustrated in figure 2. Effectively he is suggesting that around 1970, the Kinshasa airport office was split into two (one open to the public and the other not), and that the functions of the former Airport were divided between them. Those collecting post-independence material may be interested to see (Fig.1) a 1976 cover in my collection - that is after the airport was split into two - which has both the older canceller as well as the newer Kinshasa 24. Presumably the history of the cover is that it was accepted at the postal counter open to the public to send ‘registered’ to Ohio , USA on 22nd November 1976. It was duly cancelled with the then current Kinshasa 24 canceller (I.7-CEL/-), and with an extra cancel on the reverse as required for a registered article. Interestingly, the cover must have then passed to the ‘back office’ where it received the normal transit mark for registered items. However, the canceller used was the older Kinshasa I.6-6 and not the I.7-OEL that one would have expected. This has resulted in the two cancels being very nicely next to each other, and they are both quite clear (Fig.2). What is not apparent is whether this would have been applied in the Kinshasa 24 office or in the Kinshasa CTT office. - the old Kinshasa Airport cancellers could have been found in either! We can see from the other transit marks on the reverse (Fig.3’a’ and ‘b’), that it took eight days to get to Ohio and despite the sender having paid the extra money for registration, it actually travelled in the ordinary mail. In Bulletin #130 Ed Lavitt told us of an ‘Interesting Card’ purporting to have Lado connections. There appeared to be no satisfactory explanation of its travels though Ray Keach had managed to concoct a theory. One thing for certain, it remained a mystery! Whilst not wishing to put a damper on things, Lado related stationery carries a premium but what value is placed on an apparently mischievous and contrived item is anyone’s guess. L’Abbé Gudenkauf reminded us of the ‘Dubious and Forged cancels on covers from the Lado Enclave’ in his article (Bulletin 40, June 1981). This appears to fall into the ‘Dubious’ category. ‘A ‘manipulative collector’ living in Buta sent the ‘self-addressed manufactured’ card (under cover) to his pen- pal in Boma. By request, his pal simply posted it back to Buta through the normal mail. The ‘manufactured’ card had been erroneously dated Buta 28 November 1909 and by favour, received the White Nile T.P. cancellation of 31st January 1910. The routing is simply contrived and mischievous.